How Does Chemistry Work In FIFA 19 Ultimate Team? Since Ultimate Team was introduced in FIFA 09, chemistry has been a huge factor when building squads. Figuring out how to reach the elusive 100 with every single player on 10 has had avid FIFA fans scratching their heads for years. 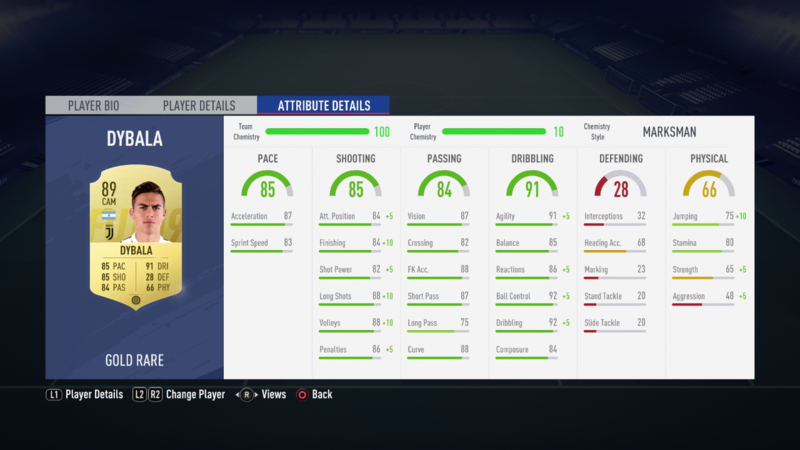 The system has evolved significantly since it was first released and now with FIFA 19 Ultimate Team, there are even more changes to how chemistry works. FIFA 19’s chemistry now includes chemistry style icons, attribute details and a new formula for calculating chemistry. As seen in the last few FIFA games, chemistry styles are returning. 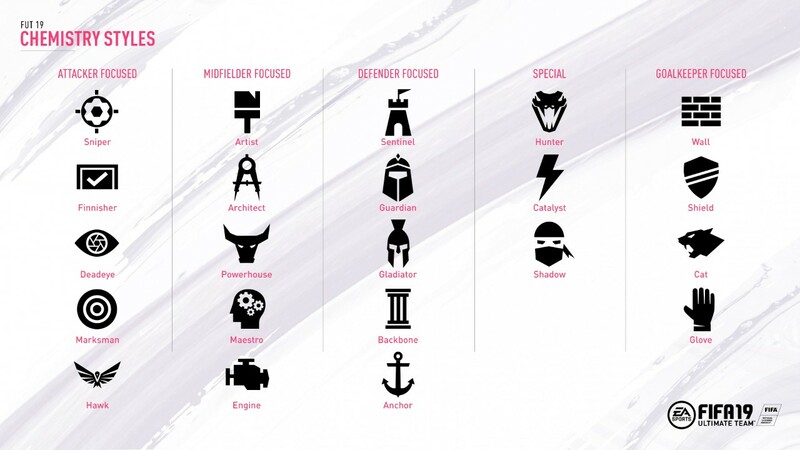 Each one has a slick new icon that will help to identify the chemistry style applied to each individual player easily. On top of that, you can now delve into the attribute details on each specific player to see the affect chemistry has. In the image below, you’ll see that Dybala has team and individual chemistry at the maximum, so a lot of his attributes have been boosted. Once you’ve played Ultimate Team for a while, you get used to estimating how much chemistry each change will give you. EA has gone into detail this year though about the exact formula they use to calculate chemistry. For example, chemistry effects are applied at the start of every game and aren’t affected by formation or position changes when in-game. Players in the starting 11 receive 25% from the overall team chemistry and 75% from individual player chemistry. If the resulting number is greater than 50, players’ attributes which are affected by the active chemistry style start to improve towards their maximum value. If the boost from this value would increase a player’s attributes above 99 the boost will cap at 99. If the resulting number is 50, the number is neutral and the player receives no changes to their base attributes from the active chemistry style. If the resulting number is 49 or lower, the players’ attributes are reduced by the negative modifier towards the attribute minimum of 1. 1 x (max boost value) = attribute change. .25 x (max boost value) = attribute change. *In some rare instances, there will be a minor variation of the exact attribute value received by a player due to the effects of how each console’s processor handles floating point operations prior to the application of chemistry. It goes on to link to this spreadsheet that explains how each individual attribute will be affected by maximum chemistry. For the first time ever, stamina will also start to modify player attributes as it depletes in each game. Acceleration, Agility, Jumping, Strength, Reactions & Marking will all gradually decrease the longer a game goes on. Make sure you check out our guide to the top 10 players in FIFA 19 if you want to know who to build a team around.